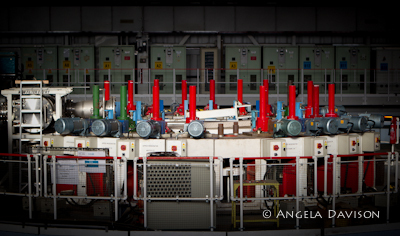 Photowalk at Rutherford Appleton Laboratories puts one of my pictures in the final 10! Shutters on ISIS target station 1. Towards the end of November, and through an email from the Royal Photographic Society, I leapt at a chance to go to the Rutherford Appleton Laboratory in Oxfordshire for a 'Photowalk'. The Science and Technology Facilities Council asked photographers to attend 3 different science locations across the UK and take pictures. You were then allowed to submit up to 5 photographs. Out of 200 photographers, one of mine got into the last 30 which then went to a public vote. It's now in the final 10 waiting to be judged by a panel. There will be 3 regional winners and an overall winner who could choose to go to CERN as their prize!! I'll keep you posted! Unfortunately I did not get the regional or national prize, but am told that the final 10 will be on display at the science facilities throughout the UK.